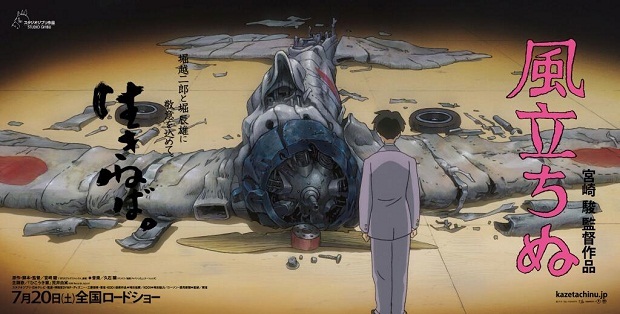 Check Out Hayao Miyazaki’s New Trailer for ‘The Wind Rises’!! Hayao Miyazaki’s new film is finally coming to the USA. It’s been doing very well over in Japan over the past month. So well in fact that it is has retained the number one film for the past four weeks. Now, the film will debut in America at the Toronto Film Festival next month. Miyazaki is one hell of a director who has given us ‘Princess Mononoke’, ‘Howl’s Moving Castle’, and ‘Spirited Away’ to name a few. This new film is garnering a lot of attention as well as controversy as it has an anti-war message. That aside, the film itself looks amazing, just like his other films. The official synopsis is: A look at the life of Jiro Horikoshi, the man who designed Japanese fighter planes during World War II. I cannot wait to see this. How about you? The Collected Works of Hayao Miyazaki Will Be Released by Disney!!! Film Review: ‘The Tale of Princess Kaguya’!! This entry was posted on Thursday, August 15th, 2013 at 12:16 am	and is filed under Film, News. You can follow any responses to this entry through the RSS 2.0 feed. You can skip to the end and leave a response. Pinging is currently not allowed. I can also not wait. It may kill me! « Check Out The Trailer for ‘Escape Plan’, Starring Arnold Schwarzenegger and Sylvester Stallone!!! There is more to life than to watch other people live it.